I wasn't sure what to expect from Arizona's eateries, so went with an open mind and had a great time. Not all of the food was stellar, but some were certainly noteworthy for their sheer novelty and heat factors. I'd like to highlight some of the better ones. First off, we headed over to Pro's Ranch Markets, which a friend had recommended. Upon entering the massive Whole Foods of all things Latino, complete with neat stacks of chile and tamarindo as well as an incredible food court bustling with people devouring tortas and splurping glistening sopa de res, we were smitten. This paradise of a market offers everything from freshly made tortillas ("from an old fashion tortilla factory on the premises," according to the website) to prepared meats and fish. 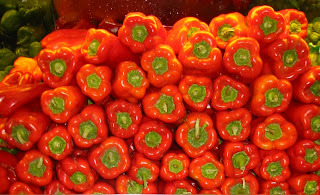 After marveling at the amazingly fresh produce and abundance of chile varieties, we were ready to eat. We got an order of the fish tacos, which were my personal favorite, ceviche de camarones (raw shrimp with veggies slightly cooked by citrus marinade), a carne asada taco plate, carne asada sandwich, the beef soup, and to round it off, watermelon aguas frescas (literally "fresh water"), which was just what I needed to quench my thirst in 100+ weather out in desert-land. 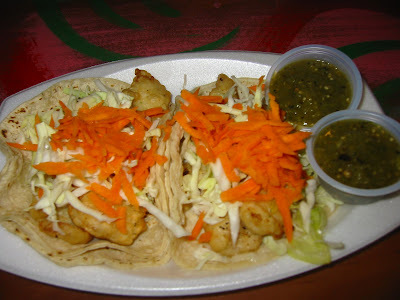 Back to the fish tacos. The freshly-made tortillas made a huge difference as they were the first thing you bit into. But the star of the meal was hands-down the fish. They were fried to perfection but not greasy at all. Crispy on the outside and moist and soft on the inside. The fish was very fresh. 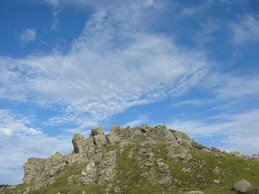 You know how some places try to mask fishiness with blobs of the thousand island-type dressing? I'm glad they went easy on the dressing so I could really taste the fish, which I did and loved. 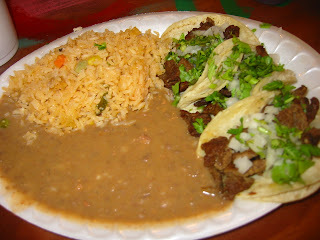 The carne asada tacos were ok but they tasted like the meat had been pre-cooked and sitting there for some time, which it had. 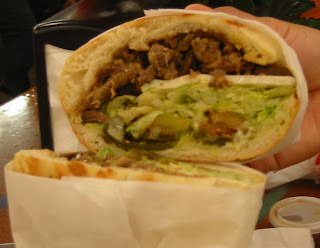 Likewise, the torta, which used the same meat, was average. The bread was soft and I liked the cheese, but pre-cooked meat is pre-cooked meat. The beef soup with vegetables seemed like a great hangover remedy or just plain old comfort food. The sizeable meat chunks were very tender and had absorbed the great flavors of the vegetables and spices, as if they had been slow-cooking for hours on end. 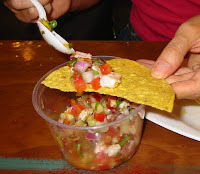 The shrimp ceviche was refreshing when we had it, but we suspect that one of our companions got sick from it. Although everyone else was fine, I'm not sure I'd recommend it, just to be on the safe side. I suppose that as a general rule, it's not very wise to have raw seafood in 100+ weather. 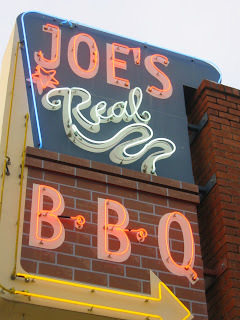 Now on to Joe's Real BBQ, for some ribs and brisket. 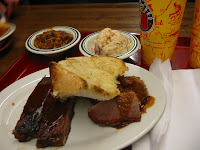 I had the Meat Plate that comes with 1/2 lb of one or two meats with two sides (BBQ pit beans and potato salad) for $10.99. I thought it was a good deal until I got the puny portions and had to buy another set. The ribs are usually my favorite but I liked the tenderness of the brisket and pulled pork that our companions had ordered better. The BBQ sauce came in regular and spicy -- I liked the latter. I should disclose that my BBQ heart belongs to the Salt Lick near Austin, TX, followed by Fat Matt's Rib Shack in Atlanta, GA, but then again, I have yet to take my dream BBQ road trip to the South to sample all the best BBQ in the country. I think there should be a BBQ Museum created a-la-Ramen Museum in Japan, complete with tastings of all the best BBQ. The sides? The beans were good, potato salad (they also had a cheesy version that congealed too quickly) standard and mac'n'cheese decent. The fluffy bread the plate came with was light and airy -- a good accompaniment to all the other heavy sides. 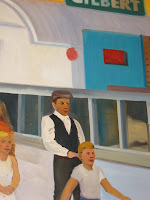 Housed in a real 1929 brick building from the "golden age of agricultural Arizona," the restaurant features engaging murals of that bygone era as well as props and posters that conjure up images of how people lived during those times. There is also plenty of outdoor seating for cooler days. 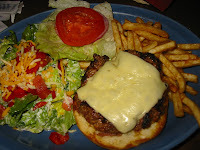 During my research, I repeatedly heard about this infamous Habanero burger served up by Carlsbad Tavern in Scottsdale. Being a burger-lover and heat-seeker, I proceeded to dare myself to try it. The burger meat was surprisingly good quality, considering the place reminded me of a horror-themed restaurant, and the heat did not disappoint. They had added ground habanero peppers into the patty and at first bite, nothing happened. Seconds later, it crept up on me -- slowly but surely, until the heat started spreading its goodness. It was memorable and I was sweating profusely, but it didn't seem as bad as the ill-fated experience with habanero my dinner companion once had in Merida, Mexico. Thank God the waiter warned me not to drink water as that would have magnified the heat. The burger generously comes with a free glass of milk instead, which I politely declined. A few things the burger did not have going for it were the dense and stale bun and the fries dripping with grease. And what's up with the side salad drowning in ranch dressing? Last stop: Med Fresh Grill on S. Mill Avenue near Arizona State University in Tempe. Cities are so close to each other that going from Phoenix to Scottsdale or Tempe takes no more than 20 minutes. I was skeptical at first as the place looked too pristine, but I was pleasantly surprised at how juicy and moist my chicken kabob was. 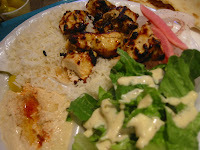 I can't say the hummus was the best I ever had but I would most definitely return for the chicken. I had many others on my list of places to try -- such as a famous hot dog place -- that will have to wait until my next trip. you should come visit, girl. and bring along your little men. you've got me checking out your blog everyday. me want something new to read! glad you're reading! why don't you post your lovely ttukbokki recipe or tagine recipe? I could post pix of your ttukbokki from my last visit. that's strange, phas, b/c i also had the watermelon agua fresca and was fine. maybe this person's immune system was down from fatigue and sleep deprivation. why don't you write a review on my ddukbokki? I'd like that very much. it's been so long i've tasted it you may have to courier it in a box :-) i do recall your recipe. i may run it by you by email before posting, then. thanks for sharing.